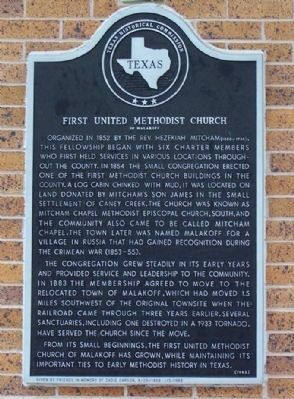 early Methodist history in Texas. Location. 32° 10.217′ N, 96° 0.611′ W. Marker is in Malakoff, Texas, in Henderson County. Marker is on South College Street near East Mitcham Street, on the left when traveling south. Touch for map. Marker is at or near this postal address: 107 South College Street, Malakoff TX 75148, United States of America. Touch for directions. Other nearby markers. At least 8 other markers are within 10 miles of this marker, measured as the crow flies. 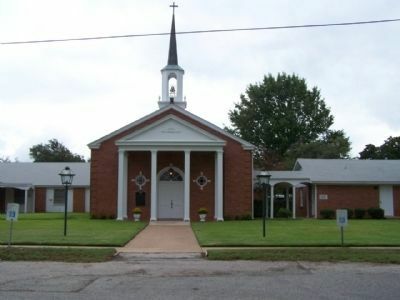 First Baptist Church (approx. 0.8 miles away); The Trinity River (approx. 5.2 miles away); The Malakoff Man (approx. 5.2 miles away); William Richardson (approx. 7.9 miles away); John Matthews McDonald (approx. 9.1 miles away); Stella E. Parsons La Rue (approx. 9.2 miles away); Joseph Thomas La Rue (approx. 9.2 miles away); Dulcinea Ann Holland Thompson Avriett (approx. 9.2 miles away). More. Search the internet for First United Methodist Church. Credits. This page was last revised on June 16, 2016. This page originally submitted on November 20, 2012, by Mike Stroud of Bluffton, South Carolina. This page has been viewed 349 times since then and 4 times this year. Photos: 1, 2. submitted on November 20, 2012, by Mike Stroud of Bluffton, South Carolina.